The ticket was sold out prior to the match, for the first official Osaka derby of this season. The voltage in the stadium was reached to the highest with the heat created by supporters from the both team, and the stage was ready. It was Cerezo Osaka who had a chance first. After 1 minute from the kick-off, Kazuya Yamamura made a down the line pass to Kenyu Sugimoto, and Sugimoto dropped the ball to Yoichiro Kakitani, who ran into the penalty box and made a shot, however the ball went over the bar. Cerezo continued their attack with brisk pass-work, and, in 11th minute, Gamba Osaka had an accident. Masaaki Higashiguchi and Genta Miura were collided each other when they both reacted to Kim Jin-hyeon’s kick. Miura’s head hit Higashiguchi’s cheek, then Sugimoto picked the loose ball and made a pass to right side. Riku Matsuda made a long cross to the other side, and Kakitani shot it with his header, but it was saved by Higashiguchi who recovered from the collision and managed to stand up. However, Higashiguchi was not able to continue to play because of this incident, and substituted by Mizuki Hayashi who made the J1 league match debut with this appearance. Gamba’s fighting spirit was ignited by Higashiguchi’s chagrin of staying on the pitch. In 24th minute, and 26th minute, Shu Kurata sent a pass to Hwang Ui-jo, and his 2nd header was so powerful, but denied by Kim Jin-hyeon’s good save. After 30th minute, Cerezo started to regain their pace and had several chances but failed to execute. Then in 39th minute, the pass from Hotaru Yamaguchi was intercepted at the mid pitch, Gamba took it quickly to the front, and Matej Jonjic gave a penalty by his try on Hwang Ui-jo on the foot. In 41st minute, Hwang Ui-jo took the penalty kick, and Cerezo ended the 1st half 1 goal behind. It was also Cerezo who carried out an attack into the opponent territory first in the 2nd half. In 49th minute, after exchanging several passes, Matsuda sent the ball to Kakitani and he broke through to behind the defence line, but couldn’t reach to shoot. In 51st minute, Toshiyuki Takagi made a long pass to Yamaguchi, Yamaguchi made a sharp cross to in front of the goal, the ball was punched by goalkeeper Mizuki Hayashi and got loose, but Cerezo couldn’t manage to lead it to a goal. Then, in 55th minute, Gamba had a good chance. 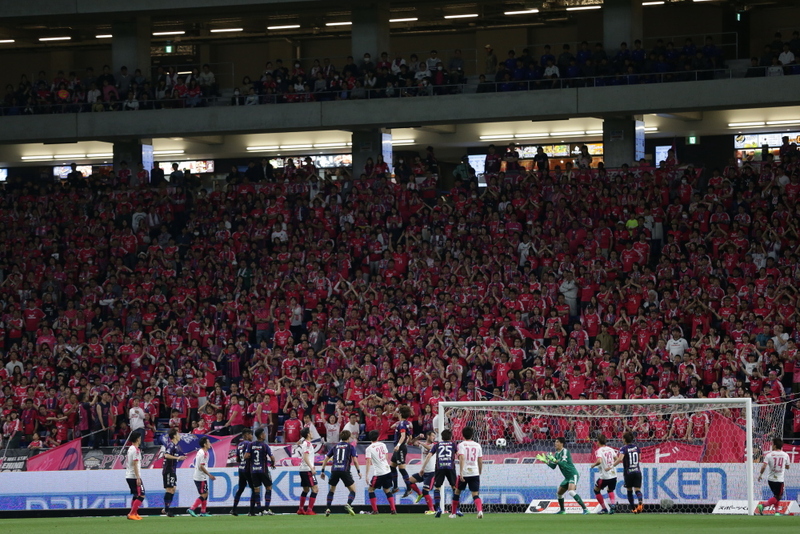 They made a break through into Cerezo’s right side, Hiroki Fujiharu sent a cross to Jungo Fujimoto who made a decisive header, however, Kim Jin-hyeon touched the ball with his hand, and caught it firmly when it came back after hitting the post. By having such a super save of the reliable guardian deity, Cerezo didn’t allow Gamba an additional goal. Though Cerezo had more chances than the opponent after that, e.g. by Sugimoto in 85th minute and Takagi in 88th minute, the shots didn’t go in inside the frames. In 89th minute, Yamaguchi stole the ball, carried it over and made a sharp cross, but it was just one step off-timing to Kakitani who jumped into the ball. At the end, the lost goal by penalty in the 1st half haunted the rest of the game, and Cerezo was defeated 0-1 by Gamba.